This is one of those tough to get your head around posts. There has always been many choices in the area of Task List managers for the iPad, but recently there has been a jump in number of app updates making us re-examine our ToDo viewing decisions. 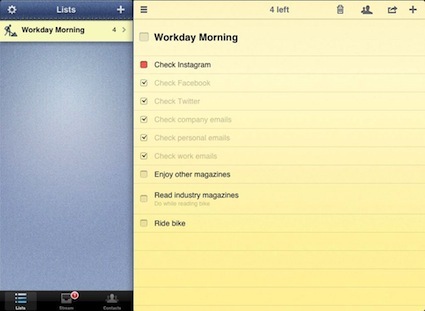 Pocket Lists is one we have used on the iPhone since it first came out. It’s strengths are in the area of being able to get a list knocked out quickly, add identifying icons to lists, have the top items from many lists joined in a ‘stream’ view, location based (arrive/leave) tasks, color coding, sync across many systems and repeating tasks/lists. 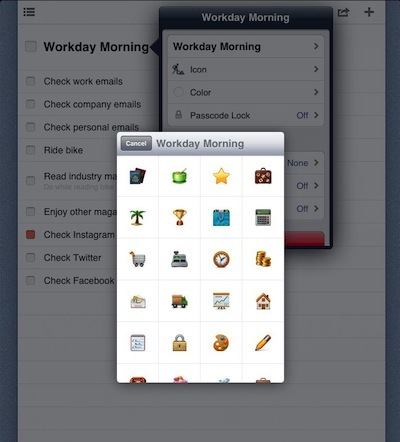 All the right things to get in and out of an app, without all the cuteness clutter. 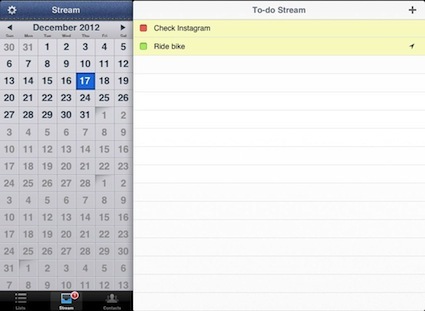 Two features missed in many other solutions is the ability to add a note to a task that shows in the over view screen and having a task be in a hierarchy of another. 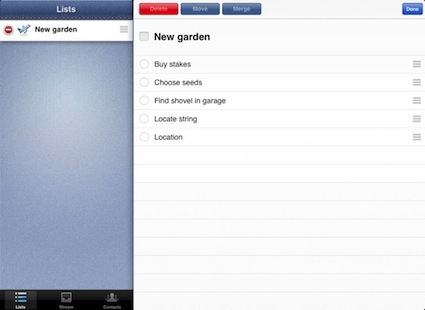 So many features all coming together in what appears to be a simple ToDo list app. The ‘+’ button always add a new task to the top of the list. Not a bad thing, especially for long lists, but in portrait view there is no way to re-order so they are stuck there. After the initial list is created by typing a line and hitting ‘next’ to add another below, there is no getting back to the keyboard in the list overview in order to access the ‘next’ option. There is a ‘Sort’ option from a pull down in the upper right corner. That auto sorts the color coded tasks to the top of the list, then everything else alphabetical below it. We were getting frustrated with the lack of manual sorting, a feature we enjoy in the iPhone version, when someone noticed that the feature is available in landscape view. So, looking at a task list in a long portrait view has tasks that are stuck where they are, but flip the iPad to wide view and drag/drop your list order as you please. We’re sure that is an easy fix for the developers. Actions can be taken on individual task lines without going to it’s editor. Tap/hold allows the line to be deleted. Drag the line to the right and it will become a sub/indented task of the item above it. Drag back to the left to undo the task being in hierarchy. 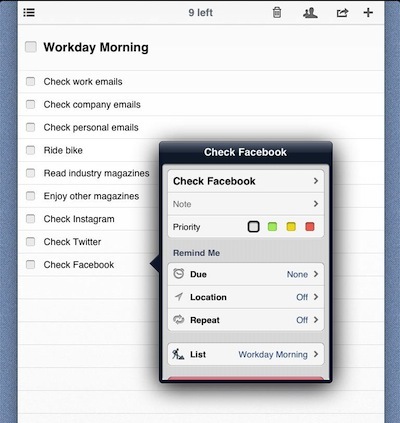 While we don’t use Pocket Lists for sharing lists across team members to collect updates, it is possible. The ability to add identifying icons, color code, sort and sync across personal devices makes a very nice option in the area of away-from-work project lists.